I was a bit afraid to try it on, because I knit all that at school today and it might’ve been too small…but I just tried it on and it fits great! Heel in the heel place and all. I put that sock on a spare circ (the evil circ) so that I can do the other sock up to that point. Then I’ve got one more ball to divide between both socks – I was hoping for over-the-calf socks, but we’ll have to see. 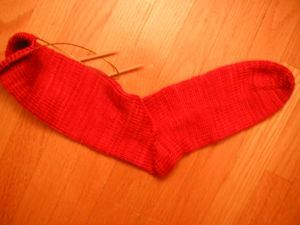 It’s just about four inches on each sock that I’d have to do, but factor in maybe one or two increases and ribbing, and I’m cutting it pretty close. We’ll see. Here’s some progress on the Monk’s Travel Satchel, which has travelled from home to school and back again many, many times. It will continue to travel that route many, many, many more times. 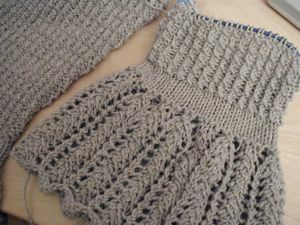 I’m done the front and the back/flap, and I’m starting the dreaded gusst/strap – 77″ of seed stitch. In cotton. 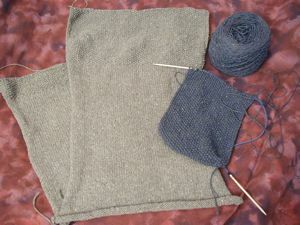 The second sleeve of the Corset Pullover is progressing slowly. 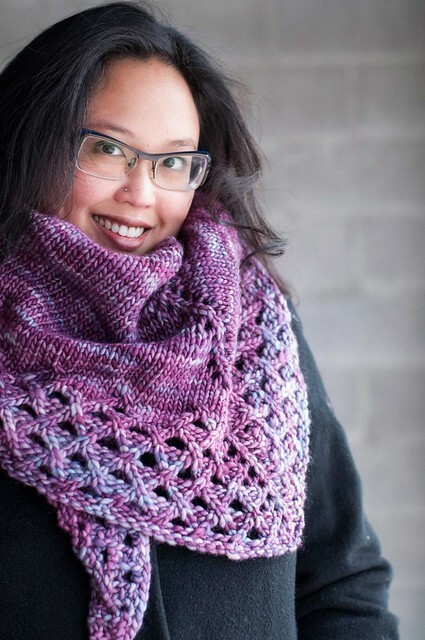 I realized why the lace at the bottom of the sleeve seemed so slow – it’s 96 stitches around! Then it decreases to a much more manageable 48 stitches before increasing back up again. It’s going a little faster now that I’m on the twisted rib. That’s it for now! Have a good Friday!